3 Installation and Activation of the HyperCommerce . Before getting started, be sure about the compatibility of the theme with your current WordPress version. HyperCommerce is compatible with WordPress version 4.7 or higher. So, it is advised to use latest version of WordPress for best experience, added features, and updated security patches. Next, we will be now going through installing HyperCommerce into your WordPress. Installation and Activation of the HyperCommerce . You can also install HyperCommerce theme via searching in WordPress and installing it. 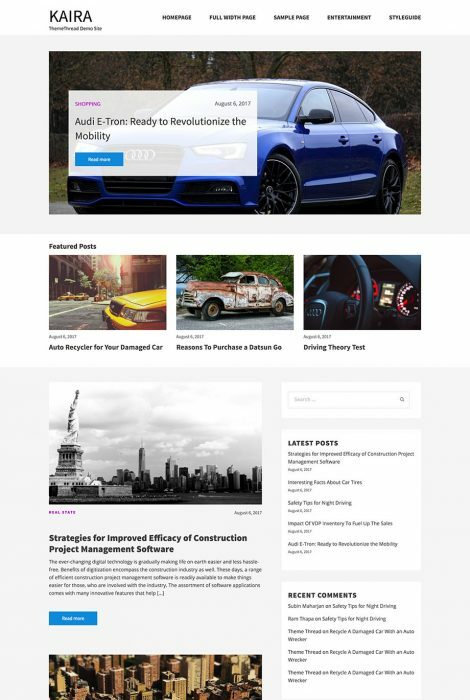 Goto Appearance->Themes and find the recently uploaded HyperCommerce Theme. 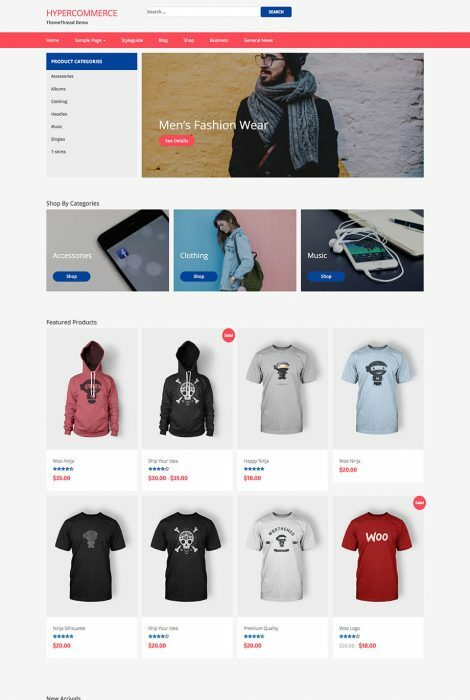 HyperCommerce is now activated as current theme and can be customized as user wants. Hypercommerce includes a dedicated woocommerce based homepage. You can enable the homepage by following these steps. Click on publish to save the settings. This option enables users to customize homepage by allowing users to set up to three categories as featured category. 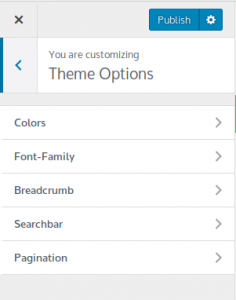 Click on Featured settings of Homepage settings within Customizer. Enable the category section by checking the “Show featured categories” option. Select the three woocommerce categories that needs to be featured. Make sure the categories have featured images. Input the title for the section. By default it is set to “Shop by Categories”. Enter the label for the button available in this section. Defaulted to “Shop”. This custom theme setting allow user to set featured product in the homepage. You can set different number of products as featured in homepage. Follow these steps. Click on Featured Products settings of Homepage settings within customizer. Enable the section by checking “Show featured products”. Enter the title for the section. (Default: “Featured Products”). Select the number of products to display. The option includes Four, Eight and Twelve Products. Don’t forget to publish once all set. This option allows user to set up to Twelve new items to be featured in homepage. Enable the section by checking “Show new arrivals Section”. Set the name for the section. Default: “New Arrivals”. Select the number of products to display. Options include Four, Eight and Twelve. Hypercommerce features a beautiful slider in the homepage. The slider can display different items filtered by a certain tag. You can set the slider preferences by following these steps. Click on Slider settings of homepage settings within Customizer. Enable the slider by checking “Show slider”. Enter the tag name that will be used by the slider. Default tag: “featured”. One of the basic functionalities of WordPress Customizer which is basically used to change background color and header color of site. However, in HyperCommerce , users are given options to change the color of title link, navigation menu and category link. HyperCommerce provides a custom breadcrumb and controls to enable and disable the breadcrumb. 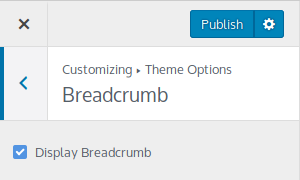 Click on Breadcrumb within Theme Options in the Customizer. Check “Display Breadcrumb” to show the breadcrumb. Hypercommerce provides options to show/hide searchbar from the theme. 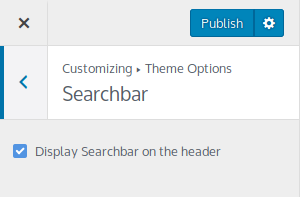 Click on Searchbar within Theme Options in Customizer. Check “Display Searchbar on the header” to show the searchbar. 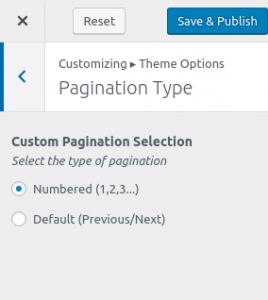 HyperCommerce also provides custom pagination options. User can choose either ‘Next/Previous’ or ‘Numbered (1/2/3/4……)’. Hypercommerce includes a specific panel for customizing the woocommerce shop page. 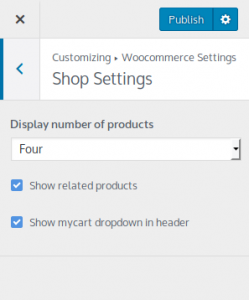 Click on Shop Settings within Woocommerce Settings in Customizer. Select the number of products to be displayed per row. Options include Two, Three and Four. Check the “Show Related Products” to display the Related Products section in Shop page.